Rinse and trim any visible fat from chicken. Cube into 2" pieces. In a lg. skillet or Wok on medium heat, combine 1 tsp. oil, teriyaki, 2 T. soy, ginger, sesame seeds, and chicken pieces. Cook 20-25 minutes. Pour into a serving dish. Prepare rice per directions on box, set aside. Add 1 T. butter, onion, and zucchini to skillet/Wok. Turn heat to med-high, and cook 10 minutes or until vegetables are tender. 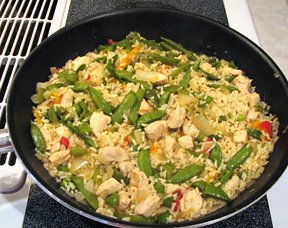 Add 1 T. butter, 1 T. soy, and cooked rice to vegetables in skillet, toss well. Using spatula, push rice and vegetable mixture to one side of skillet. Add 1 tsp. oil to empty side of skillet. Pour in beaten eggs and scramble done. Mix into rice mixture. 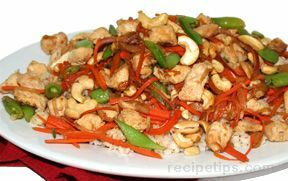 Serve rice and vegetables with chicken. 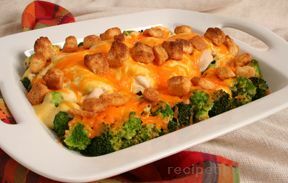 Optional: Can add steamed broccoli florets and grated carrots in with veggies.